A quick and easy service for an affordable luxury chart printed on high quality paper and delivered to your door. Your family details are handled in complete confidence on a secure system here in the UK. *Please remember to tell us the name of your gedcom file and the person the chart is based around when you place your order. How to get your gedcom file. We will print a chart with a full line up of individuals like your chosen chart type and style on a high quality paper and send it to you in a strong cardboard tube. 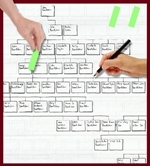 Don't worry if your chart isn't complete as our system will just leave out any missing data or individuals. 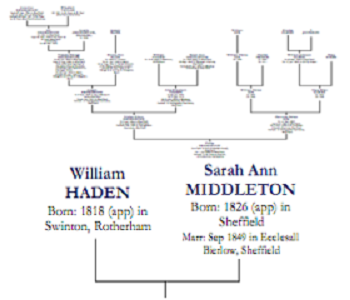 All you need to do is send an email with your gedcom file to charts@my-history.co.uk, along with the persons name that the chart starts from and we will do the rest. Your chosen person at the bottom, then parents, grandparents, great grandparents and so on going up the page, does not contains aunts & uncles etc. More info.. Your chosen person at the top, then their children, grandchildren, great grandchildren etc coming down the page. Also includes spouses. More info.. Chosen person at the centre, then parents, grandparents, great grandparents and so on going up the page, and their children, grandchildren, great grandchildren etc going down the page. 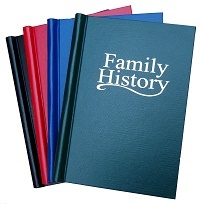 More info..
Only includes relatives of your chosen person or couple, does not contain relatives of people married into the family. For example someone that marries your brother will show on the chart but their parents and siblings will not. 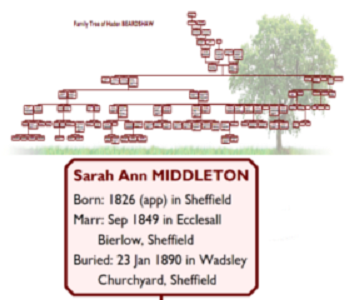 * More info.. * If you want absolutely everyone on the chart, please send us your gedcom file and ask for a quote for an everyone chart. Choose you chart type, chart style and material from the options below. Your chart will be sent out rolled in a strong cardboard tube with plastic end caps. We can even print onto a wide canvas and stretch it around a frame ready for you to hang on the wall. Depending on the size. Please click here for instructions on how to get your data from Genes Reunited as a Gedcom file.